Ken Morrish has been growing apples in his backyard in the village of Colaton Raleigh in Devon for 45 years, and in that entire time, he’s never seen something like the half-green, half-red Golden Delicious apple he recently plucked from his tree while gathering some apples for his sister-in-law. 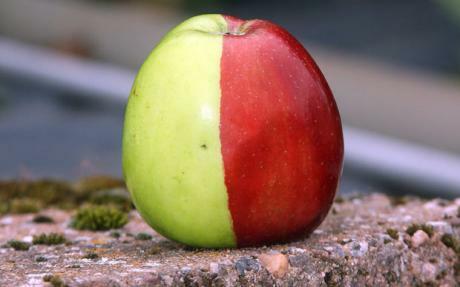 Finding a fruit like this is literally a million-to-one shot, given the perfect bifurcation of the two colors of the apple. Some difference in shading can be attributed to varying degrees of sunlight the fruit gets exposed to, but something like is practically impossible. There have been other crazy food mutations, like smiling jalapenos, but I’ve never seen an apple like this, and I go through Golden Delicious apples like a hyperactive child goes through a box of candy. They’re my favorite of all the apple breeds, just nosing out Fuji and Granny Smith. Just looking at the red/green mutant up there makes me want to take a big bite right out of the dividing line!